This case study was originally a competition entry. 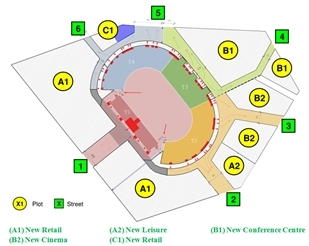 The project relates to the redevelopment of an existing expo area currently containing business and assembly premises. 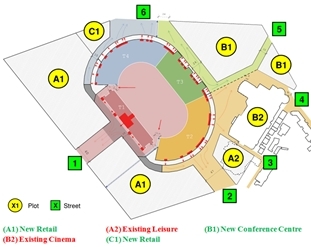 The redeveloped area shall contain international corporate event and entertainment facilities with shopping, leisure and recreation, culture and government facilities. A design team has been appointed to develop a masterplan for the area in conjunction with Arup as their advisers. The expo area which shall be redeveloped contains an existing stadium which was built in 1930. The stadium hosts events such as football matches, rugby matches, athletics and concerts with an event occurring on average every two months. The proposed buildings constructed as part of the redevelopment will be in close proximity with this existing stadium. Therefore it was imperative to ensure that the evacuation or emergency service access for the stadium was not adversely affected by the proposals. 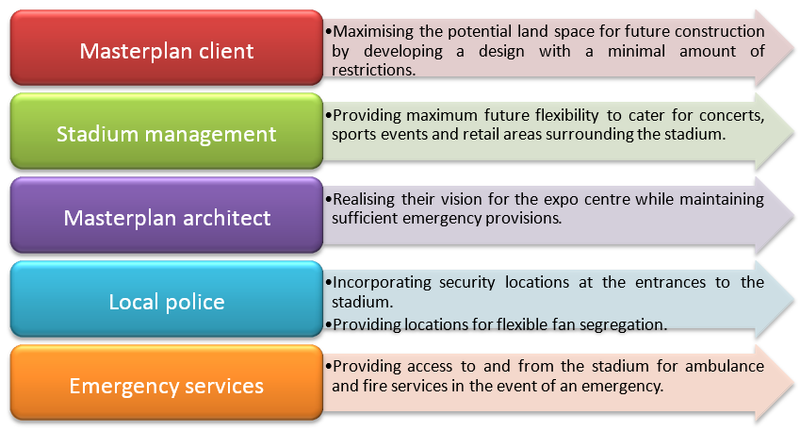 Therefore Arup undertook a study of the public space surrounding the stadium for a reference design of the future masterplan. Please note that the results of this study do not represent the current situation around the stadium. Previously the area surrounding the stadium was open and easily allowed evacuating occupants to disperse freely upon exit from the stadium. The proposed masterplan restricted the areas for escape and emergency vehicle access to those shown in green below. The aim of the analysis was to study the potential space that could be developed around the stadium without adversely affecting means of escape from the stadium. The results of the study would then be used to inform our client on how to maximise their land use and allocate plots to be tendered. As part of the projects development process numerous stakeholders, each with their own agenda were involved as outlined below. Due to the diverse range of stakeholders, our results had to be communicated to a wide ranging audience. Dynamic evacuation modelling was considered the best approach to communicate the results and design developments to all stake holders. In addition this approach is considered to provide a more accurate analysis when compared to static hand calculations. Our evacuation model provided a visual tool to present results to all stake holders, but importantly, also acted as an interactive design development tool. This provided the relevant stake holders with confidence in the design at all stages of the process as the results could be visually demonstrated. The dynamic evacuation analysis was carried out using MassMotion, a 3D agent-based simulation tool, populated by individual, autonomous agents capable of making independent decisions in order to achieve a goal. Developed by Arup, MassMotion is founded on the construction of behavioural profiles for agents, and the construction of a 3D environment for these agents to occupy. Within the software each agent is provided with an origin and destination (O-D) upon which they make a series of choices to arrive at their destination. Agents will recognize congestion and will consider alternative routes based on their familiarity with the environment, their own specific personality and take into account current conditions. The proposed masterplan incorporated a circulation zone surrounding the entire stadium. From this circulation space, streets provided a route for occupants to disperse away from the stadium perimeter as shown opposite. In addition the masterplan incorporated two phases during the construction program as shown below. Due to lease agreements for existing buildings on the site, construction could not begin on plots to the eastern side of the stadium until a later date. To ensure that each phase of the development would not adversely affect the existing stadium evacuation each of these phases was reviewed in turn as part of the study. In addition each phase required a number of masterplan options to be reviewed. The base model developed was constructed using the architect’s masterplan drawings for each phase and option. While the masterplan drawings provided the model boundaries for the areas surrounding the stadium, the stadium itself formed an important part with regards to how many people flow out of the stadium over a given time into this public space. 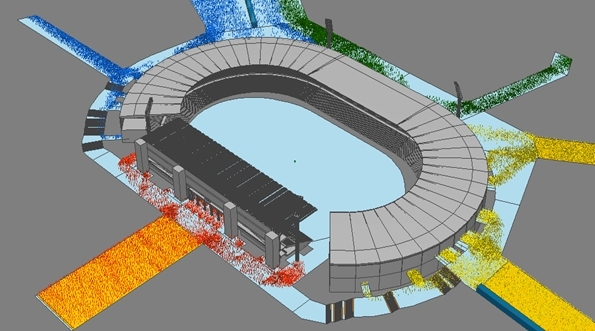 To accurately model the public space surrounding the stadium a survey of the existing stadium exits was carried out it to determine their location and size. This allowed us to only model the flow of people from the stadium into the public space and not all the internal routes within the stadium. It is acknowledged that this scenario meant all occupants dispersed into the public space at a similar time. However this was considered acceptable for the assessment as it created a conservative approach. The figure below graphically illustrates one of the models produced for the study. When assessing the affect the proposed masterplan would have on the existing stadium it was important to consider the most onerous scenario in terms of maximum population. 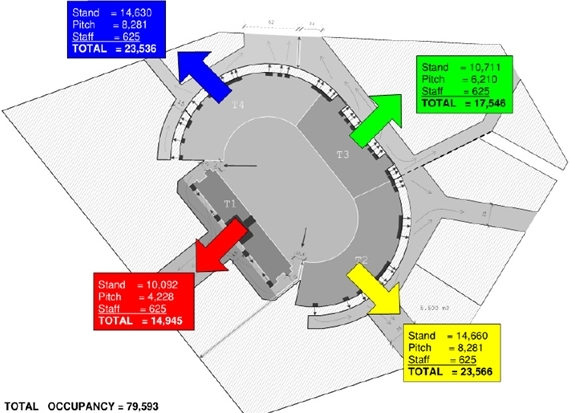 The maximum occupancy of the stadium occurs during a concert event when the stand and pitch are occupied simultaneously as outlined in the image below. 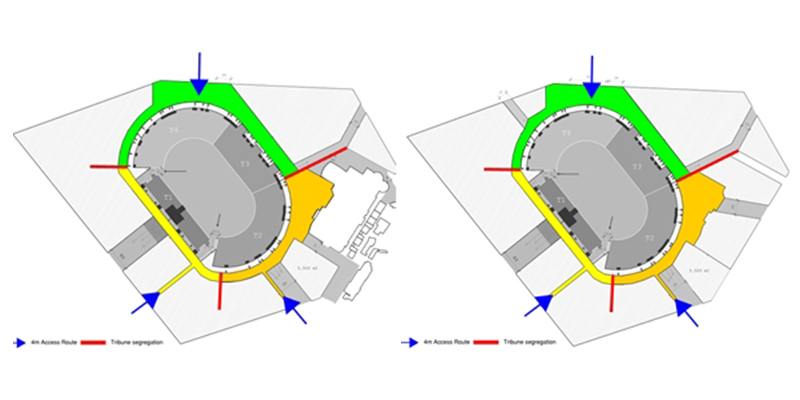 The evacuation scenarios also considered segregation between the various stadium exits necessary for security purposes. The study reviewed and rationalised various options to minimise any associated works in erecting segregation for specific events. The flow rate through the final exits is not hindered by overcrowding outside the exits i.e. occupants are able to move freely through the final exits. The critical acceptance criteria for the safe evacuation of stadium occupants was the density experienced on the escape streets away from the stadium and directly outside the stadium exits. Density maps for each model were produced to assess this. 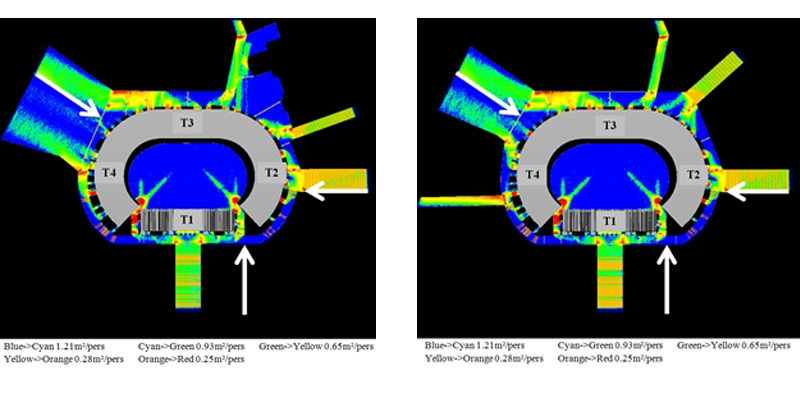 The images below provide a graphical representation of the density maps for each phase. The crowd density did not exceed acceptable limits as outlined by Guide to Safety at Sports Grounds. The results showed no significant build-up of density directly outside the stadium exits and occupants are dispersing freely upon exiting. Sufficient escape and emergency vehicle access was maintained as part of the design. The land space around the stadium for future construction development was maximised. The financial benefits for our client were maximised. Maximum flexibility in terms of stadium events was provided by natural segregation. Confidence in our approach to the design was gained through the use of visual modelling techniques. The results and design development was communicated to all stakeholders in a visual manner at a level they could all understand. The phased construction strategy was incorporated into the design. Local police security concerns were catered for by incorporating security zones at the entrances to the stadium. The architects vision for the masterplan remained intact while achieving the above results. A set of masterplan drawings as shown below and a design principles document were produced to inform future tenderers of routes which must remain clear for escape and emergency access.